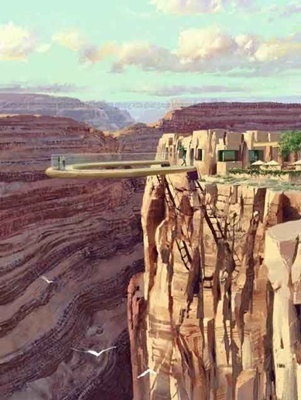 The Grand Canyon Skywalk looks amazing! What a view! That would be a crazy place to get some nice shots. 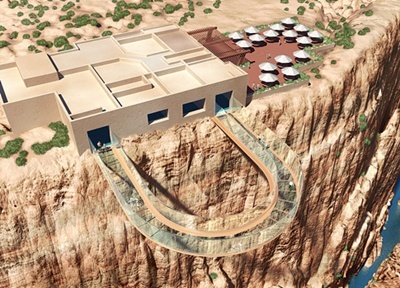 The Sky walk is simply one big rip off. I went there on December 11, 2009. 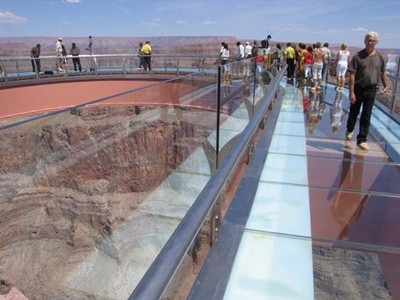 The cost is $43 for a bus trip (about 5 minutes), $32 for the Skywalk ticket and no cameras or personal items allowed. After getting the explanation from the staff that people threw staff down to just watching them falling (I guess that included cameras) the real reason surfaced up. You are escorted by a photographer who is taking a picture of you and for you. I f you want the picture, you need to say goodbye to another $30 (per each photo). They scan everybody through a metal detector to make sure that cameras are not sneaked in. The view of the skywalk is disappointing. The spot is not the best in the Grand Canyon to say the least. The view from the visitor center in the south rim is way more impressive and cost much less. This place is nothing but a TOURIST TRAP. IT is highly recommended TO AVOID THIS PLACE. Moi is absolutely correct. Although he failed to mention the 15 miles of winding, dirt road you have to travel to get there. it is unfortunate, as it ‘seems’ to be such a great place to visit. the problem is that most people will have this place on their ‘bucket list’ – and will just have to see it – regardless of what others say. when they have seen it, they will agree with you – but unfortunately not beforehand.